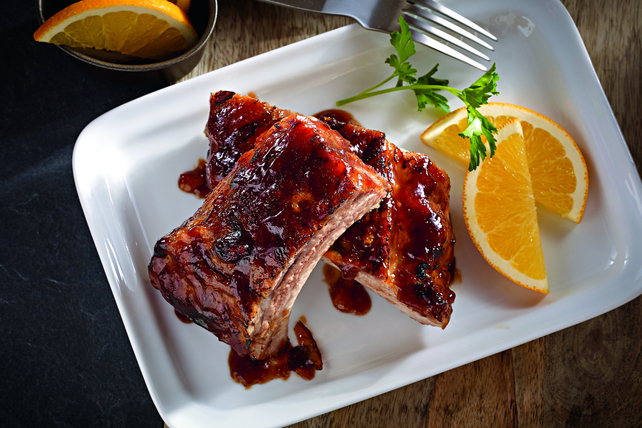 Sweet and sticky with just a touch of maple syrup, these barbecued ribs are sure to be a hit. Serve with a side of corn on the cob for a perfect summer meal. Add ribs to stockpot of boiling water; return water to boil. Cook 30 min. Meanwhile, cut each ear of corn crosswise into 4 pieces; set aside. Mix remaining ingredients until blended. Heat barbecue to medium heat. Drain ribs; place on barbecue grate. Brush with half the barbecue sauce mixture. Moisten corn with water; place next to ribs. Cover corn loosely with foil. Grill 20 min. or until corn is tender, turning corn frequently and turning ribs after 10 min. and brushing with remaining barbecue sauce mixture. Keeping your barbecue clean helps prevent the food from sticking to the grates. Plus, it keeps your food tasting its best by keeping any unwanted burnt pieces away. The easiest way to clean a barbecue is to scrub the grates with a wire brush while they are still hot, immediately after grilling. If you forget, turn the barbecue to HIGH and close the lid for about 10 min. to burn away the excess food residue. Then turn off the heat and use a wire brush to scrub the grates clean.